We all know the Farm has been meddling and slowly growing its numbers throughout Riverdale like a nasty viral infection that never seems to go away no matter what kind of meds you take. Newest Farmie, Kevin, is directing Heathers and decided to have lead teen Farmie, Evelyn, step up from a producer role (remember the Farm is sponsoring the musical) to assistant director. This means Evelyn has a lot more control and influence over the entire cast. We see her exercise that control during a pre-rehearsal warm-up when talks about universal truths, exploring personal traumas and exercising them through art. Now Evelyn isn’t wrong about using your past experiences in creating art, but we can’t help wonder about her ulterior motives and we aren’t the only ones. Betty openly dislikes having Evelyn around and accuses her of using the musical as a “recruitment drive” for the Farm. In response, Evelyn throws a company party and requests everyone to come in costume. This is a legit cool kids party complete with alcohol, song, dance (obviously), and even drugs by way of a mushroom-laced brownie. The following day, Evelyn asked people to share something with the group they’ve never told anyone before. While this might inspire trust and bonding between individuals, it also reeks of the data collection the Farm does as a guise of freeing the individual from past sins. This group sharing creates a bit of conflict amongst the cast (no different from the usual teen angst) but some minor chaos was also created and I’m starting to think that is a goal of Evelyn’s. 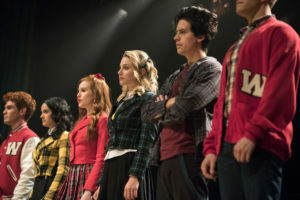 If that wasn’t enough, Evelyn held a closed rehearsal for select cast members which Betty took it upon herself to check in on and what she saw was something of a ceremony between Kevin and Fangs with Evelyn at the helm. Betty came prepared with a camera but was not prepared to hear Principal Weatherbee say that it simply looked like a rehearsal and nothing untoward was going on. In passing Weatherbee also mentioned he read Edgar’s writings and found them interesting, so we can bet on him being a convert as well. The depth of the Farm’s intrusion is somewhat revealed when the show ends and one man in the theater stands to applaud followed by many others in the audience, all of whom are wearing white. When the first man stood, Evelyn said, “I knew my dad would like it.” I guess we finally meet Edgar. We all know that Gladys Jones came back to Riverdale to take over the drug trade and it seems like she’s making her best efforts to get something going. FP reveals to Jughead that Tent City was raided and their old trailer home was taken, couple that with a few drug store robberies and it sounds like someone is creating a mobile drug lab. When Jughead uses the Serpents (who aren’t in the musical) to search for the missing trailer and locate it, they discover that the worst is true: it’s a drug lab. Jughead is clearly unhappy that his mother would defile his childhood home in the worst possible way. To add insult to injury, when FP shows up at home with a face scratched by a Fizzle Rocks junkie who was playing G&G in the middle of the street, Gladys has the audacity to act indignant. After some discussions with Betty about how to handle the whole situation (she shot down stealing the trailer back) the pair set it ablaze right before the show. They literally watched Jughead’s childhood go up in flames. 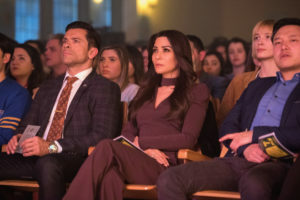 Hermione & Hiram Lodge: Perhaps the biggest surprise of all was when Veronica came home for a quick change to find her parents waiting to speak with her. Daddy dearest, Hiram, announced that they are separating and he will be staying at the Five Seasons indefinitely. When Veronica asks her mother what happened, she says Hiram knows she tried to sell the drug company out from under him while he was sick. When Veronica talked to Hiram in the hopes of getting some reconciliation, he says he left because Hermione tried to have him killed, twice. Both parents did honor Veronica’s wish to attend the show together one last time for one last happy memory. 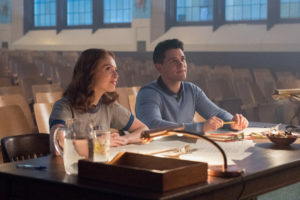 Toni & Cheryl: It’s clear from the outset that Cheryl wants absolutely nothing to do with Toni, whom Kevin brought on to be the choreographer for the show. 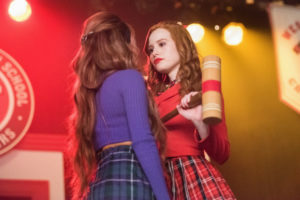 To quote Cheryl when Toni first showed up, “Does anyone have a chainsaw because what the …” Their power struggle comes to a head and Cheryl basically tells Toni to get out of dodge come Monday. Toni attempts to take revenge by dragging Sweet Pea and Peaches into the theater for a hookup session only to realize that she only wants Cheryl. The two resolved their issues when Toni showed up with an olive branch in the form of a hot drink. Who knew that having parents who loved or hated each other would set a bad example for love? Clearly, not Cheryl. Josie & Archie: The two were outed for being a thing by Sweet Pea during that lovely share session Evelyn started. Remember Sweet Pea wanted a relationship and Josie didn’t so imagine his hurt to see Josie and Archie looking cozy at the party. Archie wants to make things official but Josie? Not so much. She thinks their whole thing was built on two lonely people filling a void, which does not inspire much confidence in a real relationship. The two talk (well, sing) everything out at the boxing gym and it looks like those two are going to make a go of it for real. Veronica & Reggie: They split when Reggie wanted more (sense a theme here?) and Veronica wanted to take things slow. Fast forward to Veronica being hit over the head with her parents splitting and now she’s looking for some comfort. The two get cozy at the party and run away to bed together and Reggie thinks they could be endgame, but when he finds out that Veronica’s parents are splitting up, he wonders what her real motives were. When Veronica says she just wanted to forget and have fun and Reggie does that for her, he calls an end to the brief reunion. Kevin & Fangs: Both share that they’d been seeing Midge who was killed during the last musical and we saw them kiss at that closed rehearsal, but that relationship status is currently unknown.